A month shy of her 20th birthday, Mandy was found dead at noon Sunday after a "spunky morning" that included a full breakfast of grapes and apples, said Dr. Hayley Weston Murphy, the zoo's head veterinarian. While the exact cause of death will not be known for months, the 25-pound mammal who was the size of a cocker spaniel had chronic uterine ailments. I visited the zoo the day before with my daughter and saw the mandrills, who were not particularly active or interesting. But we items in various animal enclosures throughout the Tropical Forest pavilion that might factor into the investigation into the mandrill's cause of death: Easter decorations. On Saturday morning before Easter, zookeepers had introduced Easter decorations of various kinds to a series of exhibits in the Tropical Forest area for the animals to play with -- or eat out of. The gorilla exhibit was full of colorful streamers, long paper chains, easter baskets, disposable cups, etc., quite a sight. I saw Kiki methodically investigating the inside of an Easter basket, and a couple of other gorillas playing with a few of the items. A zookeeper confirmed my instinct, that the items had been introduced into the gorilla's exhibit in order to provide a mental stimulus for them -- which is particularly important for caged animals with substantial mental capacities like primates. A number of other animal had similar, albeit fewer, items introduced to their enclosures, although in some cases the items (e.g., woven Easter basket) was merely used to hold food. The bat exhibit was a swarm of activity around the fruit hung next to such an Easter basket. Sadly, I did not take pictures on Saturday. 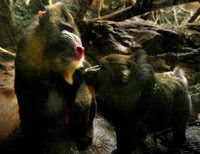 The above photo is taken from a 2005 Boston Globe article on the Franklin Park Zoo's mandrills' mating habits, showing the two mandrills in happier times. If there turn out to have been Easter decorations introduced to the mandrill exhibit, I expect that the investigation by the Franklin Park Zoo into the mandrill's death may have to look at the possibility that she ate something inedible. As noted by the Globe above, Mandy had a history of "chronic uterine ailments," but her death nonetheless appeared to be sudden and surprise the zookeepers. New Pharmacy. PharmaLife, a small "chain of friendly neighborhood drugstores," has opened at 367 Washington Street adjacent to People's Bank. While the neighborhood might not seem to need another pharmacy -- CVS is down Washington Street a few blocks -- the new pharmacy is effectively a small replacement for the former Rite-Aid (nee Brooks) Pharmacy whose roof partially collapsed under heavy snow in December, and is currently being torn down. The pharmacy replaces a store-front church that had occupied the premises for a few years. 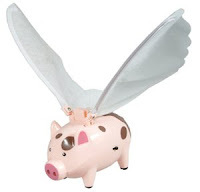 Pigs Rumored to Be Flying About. Rumor is that When Pigs Fly is considering opening a retail bakery store at the former location of Open Doors -- the flaky, new-age bookstore/gift shop/masseuse -- at the southeast corner of the Brighton Center intersection. Yes, this is just a rumor, and it sounds like it is less than at 50/50 chance at the moment. When Pigs Fly is a Maine-based bakery that provides high-end baked breads to many area supermarkets and has four retail stores. Its only store in the Greater Boston area is in Davis Square, Somerville. One block away from the site are Daniel's Bakery (under new ownership) and Athan's (a bakery and restaurant). While I enjoy good bread, including baking loaves at home, I cannot imagine what their "Mango, Pineapple, Raisin, with Toasted Sesame and Ginger" bread tastes like... particularly if spread with "cranberry onion hot pepper jelly." Ewwwww. Smoken' Joe's Blues Brunch. Smoken' Joe's at 351 Washington Street recently obtained a temporary entertainment license and appears to be having some kind of Sunday blues brunch (starting last week). Ray's Grill -- Family-Style Restaurant. The owner of Jasmine Bistro, a higher-end Hungarian restaurant in Brighton Center, is opening a family-style restaurant in Oak Square at 2 Tremont Street called "Ray's Grill." The location previously housed a pizza joint. No word on whether or not the owner will pursue a beer/wine license for the new restaurant. From Soho to Brighton Beer Garden. The owners of Soho are changing its name to Brighton Beer Garden, along with physical changes to the place (which have already begun). They have applied to extend their liquor license from 1 am to 2 am, but I hear that the Licensing Board is unlikely to award that (if they haven't already rejected the application); the Mayor's office opposed the application. As far as I know, only the Stockyard Restaurant at Brighton Landing and The Last Drop in Oak Square are licensed until 2 am. The McDonald's of Burritos -- Or the Anti-McDonald's? The cheap eats restaurant review by Sheryl Julian in this week's Boston Globe samples three different Chipotle's burrito restaurants in the Boston area, including the newest one at Cleveland Circle. Amazing how the review was timed to coincide with the exact day for a new Chipotle's to open in Harvard Square. Julian likes the burritos: "This food is indeed fresh, it's made quickly, it mostly tastes very good, and the quality is evident." 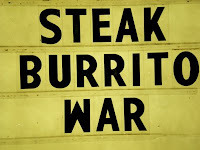 The Cleveland Circle restaurant opened near to another burrito joint, Boloco at 1940 Beacon Street, leading the Allston-Brighton TAB to declare the instigation of "Burrito Wars." 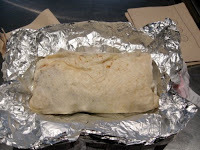 The opening salvo was a day of free burritos at the Chipotle's. Yelp.com already has eight reviews up on the new restaurant. One excerpt: "Good burritos. A bit pricey though. Guacamole on our burrito is $1.75. Not a great value. Easy to spend $10 here for one person." Boloco has eleven reviews. Chipotle's has become a big chain with 700 restaurants across the country, but McDonald's, their seven-year investor, divested in 2006. Julian now thinks of Chipotle's as the anti-McDonald's, because of Chipotle's emphasis on "organic, natural, unprocessed, family-farmed, and sustainable ingredients." If you want a reason to avoid eating at Chipotle's, just check out the Chipotle Nutritional Calculator. If you get the extra cheese, sour cream, and guacamole you can easily get that burrito to come in at over 1200 kilo-calories -- including virtually all of your daily allowance for total fat and saturated fat (for a 2000 kilo-calorie per day diet). That sounds more like McDonald's than an anti-McDonald's. Chipotle's Restaurant, 1924 Beacon St. (Cleveland Circle), Brighton, 617-232-0788. Image from Meemo's Kitchen, who has recipes to reproduce Chipotle's products at home. St. Elizabeth's Medical Center is hosting their annual Gerry McCarthy Memorial Easter Egg hunt this Saturday morning. The event will take place on the former St. John's Seminary grounds -- now Boston College "Brighton Campus" -- near the Chancery and Gymnasium buildings. Not only is Easter very early this year, but the hunt is a week before Easter, probably resulting in the earliest date on record for an Easter Egg hunt. Weather forecast? Rain and snow Saturday morning. Caritas St. Elizabeth’s Medical Center celebrates Easter with its 25th Anniversary of the Annual Gerry McCarthy Memorial Easter Egg Hunt. During the 15-minute hunt, approximately 1,000 neighborhood children and their parents will search for more than 16,000 trinket-filled eggs. A special Toddlers’ Egg Hunt will also be held for children ages two and younger. Event location is the Archdiocese Chancery/Boston College at 2121 Commonwealth Avenue in Brighton. Egg hunting for toddlers begins promptly at 9:30 a.m, Hunt for older children begins promptly at 10 a.m. Event will take place rain, snow, or shine. 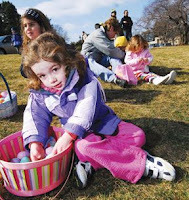 The annual egg hunt is named in memory of the late Gerry McCarthy, an Allston-Brighton resident and youth activist, who started it in the 1960’s. Word out of Allston-Brighton District 9 City Councilor Mark Ciommo's office is that the Brighton Rite-Aid (nee Brooks) Pharmacy at 399 Market Street is slated for demolition starting Monday. The building's roof collapsed partially in December 2007 after a heavy and wet snowstorm. It has been propped up with scaffolding ever since as a public safety precaution. In the last several months, however, the southernmost wall of the building has been gradually collapsing inwards. Via the AllstonBrighton2006 Google Group. Hey, amateur photographers! Take a photo of the demolition on Monday and send it to me for posting on the blog. The Boston Zoning Commission unanimously passed an amendment to the zoning code that allows only four or fewer off-campus undergraduate students to share a single apartment. The amendment clarifies the definition of a "family" under the city's zoning code after a recent court case and subsequent consent decree. The hearing room was packed both by supporters and opponents of the proposal, according to several people who attended. [Read their reports below.] The Boston Globe story posted on boston.com includes pictures of a long line of people waiting to speak in the hearing room. The meeting was long, beginning promptly at 9:00 am and continuing until 12:45 pm. There were some indications that organizations of local realtors, small property owners, and students may have been planning to attend the hearing en masse. Supporters of the amendment were apparently offered a cute button to wear during the event. The Boston City Council unanimously passed the original petition in December 2007, while the Board of the Boston Redevelopment Authority passed the zoning amendment in February 2008. The Zoning Commission approval was the last hurdle for it to pass. Mayor Thomas Menino recently wrote a letter in support of the zoning rule change in advance of the Zoning Commission's consideration of the proposal. WHDH has an online story that includes an image of Boston College's campus. Does WHDH realize that the zoning rule applies to off-campus housing, not on-campus housing? Interestingly, the proposed amendment had the support of Mayor Menino, a unanimous City Council, and a unanimous BRA Board. The meeting room was packed, standing room only, with a line out the door into the corridor. I am arithmetically challenged, but I'd say there were well over a hundred people present, perhaps several hundred. The atmosphere was highly charged, with strong emotions on display from both sides. Tensions were also high. After the Sang Vo case, which had been brought by Greater Boston Legal Services and resolved with a consent decree, it became open season for landlords to buy up Victorians, two family and three family houses, and convert them into student apartments, at exorbitant rates. This was done especially in the neighborhood he represents, Mission Hill, but also in other neighborhoods such as Allston and Brighton. This development caused massive increases in the values of these homes, with commensurate increases in property taxes for all who live nearby. Quality of life issues such as noise, litter, public urinating, etc., became larger problems for the communities. Families and young professionals found themselves displaced at worst and unable to afford housing at best. Most (he said all) major cities around the country have some kind of restriction on the number of people who reside in houses/apartments. His conclusion is that this plan, to redefine family in the zoning code so as to exclude five or more undergraduate students from any unit, is legal. The plan is not a panacea that solves all problems, but it is an important step towards saving and, in some cases, taking back our neighborhoods. By limiting housing units to no more than four students, the average rental of those units would fall from $5000-6000 per month to approximately $3000 per month, which he views as affordable. Dispersing students more broadly rather than concentrating them in clusters or "ghettos" benefits the embattled neighborhoods while having a minimal impact on the other neighborhoods that might inherit some students. After he finished speaking there was a parade of proponents of the amendment. This included elected officials – Councilor Sam Yoon, other City Councilors, a representative from the Mayor's office, a representative from the BRA, and numerous residents, including Alex Selvig, Shelby Marshall, and myself. Most of the speakers were from the Mission Hill neighborhood. We mostly echoed Ross's comments, while adding personal stories. I, for example, described the rapid turnover of the Foster Street, Kirkwood Road, Radnor Road, Gerald Road, Greycliff Road, and Lane Park area in the few years since the enactment of the Sang Vo consent decree, and that I was weary of being told that "this is a college town, man". I also pointed out that I personally am prepared to risk that the value of my home might be adversely affected by this proposal, if it will save the neighborhood. Then the barrage kicked in from the opponents. There were at least as many opponents, probably more. They appeared well organized. They included a Northeastern University economics professor who claims to live in Mission Hill, some students from Northeastern University, a real estate lawyer, and numerous property owners -- including an 82-year-old sympathetic woman -- several of whom claim to live in the community. For them it was all about rights to property and profit. (Do you detect a bit of bias here?) Half or more of those speaking in opposition identified themselves as being involved in real estate: owners, sales, and/or rentals. The proposal is nothing more than a back door attempt at rent control, something for which Councilor Ross has been fighting his entire career. The proposal unfairly discriminates against a class of people, i.e., undergraduate students. We, as residents, should appreciate the wonderful things that the institutions in general, and the students in particular, bring to our neighborhoods. The proposal is misguided because it unfairly (as well as unlawfully) penalizes property owners, most of whom (all of whom if the speakers can be believed) are responsible, and should not be held responsible for the bad behavior of a few bad apples. The problems, such as they (minimally are), can and should be solved by enhanced enforcement of existing laws and regulations -- police, ISD, the universities themselves. If the change is enacted, then it will be impossible to enforce given both the very limited resources of ISD and the privacy issues. If taxes do in fact go down, the ripple effect on city services such as schools, let alone ISD, will be severe. Rents will not go down because the parents of these students will pay whatever they have to. The "Starbuck's Crowd" will come into the neighborhood and pay rents equal to the student housing rental rates. The result is that there won't be any restoration of families or young working people to the neighborhoods. (I guess real families don't drink Starbuck's -- which is why, for example, in Brighton Center we obviously cannot sustain Starbuck's, Café Nation, and Athans). The restriction will increase the problem by spreading students further out into more houses and more neighborhoods -- bringing the problems, such as they are, to other neighborhoods. A landlord known to reside in Newton, far away from BC, who owns several properties, spoke of the wonderful improvements he made in his house, and the great tenants the students make. I must say, the "Starbuck's Crowd" argument is downright odd because it contradicts two of the other arguments. If a non-student class of people -- this "Starbuck's Crowd" -- would really move into the apartments currently housing excessive numbers of students and pay the same price the students are currently paying, then the zoning amendment will neither result in rent control nor cause property owners to suffer financially. Someone needs to go back to the talking points. I have not heard that anyone from the Greater Boston Real Estate Board, a trade association, spoke in opposition to the amendment. The Boston Herald noted that "some real estate groups are rallying their members against the proposal," yet only quotes GBREB as "[contending that] the proposal is legally flawed and won’t stand up to a challenge in court." Their GBREB website makes no mention of the issue. "Councilor Ross did a wonderful job laying out the arguments for the amendment. He has really done his homework. Quite a few officials spoke strongly, and then lots of community members spoke. Many were from Mission Hill, and a few people from the Boston College neighborhood... took our turns, too. The opposition came down to three basic arguments: they'll lose money, it won't work, and it's discriminatory. Oh, yes, and to make sure they don't lose money, they'll raise their rents so that the few students who remain will pay more. And, by the way, the government's job is to raise taxes, not to regulate the market. So higher rents, higher house prices, and higher tax rates are good. The landlords who spoke... swore that they and every other investor they know takes wonderful care of their houses (which they buy in awful condition and fix up, by the way), better than many of the neighbors; don't let students party in their houses; and believe that student behavior should be regulated -- something they would love to discuss with neighbors, colleges, and city authorities." Hmmmm... I detect just the slightest bit of sarcasm there. 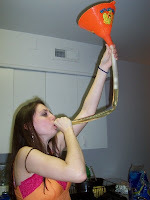 Simple examination of the police blotter demonstrates that students are partying in the houses, and that many landlords are not regulating the student behavior. As for the condition of the party houses, I can't imagine anyone in the "Starbuck's Crowd" wanting to move into one of them after they have been packed with students for years -- unless the units undergo substantial renovation after the students move out. Enforcement of the law would be driven by neighborhood complaints, city officials said. "As with other zoning violations, the Inspectional Services Department will develop an enforcement strategy to respond to any property owners reported or found to be in violation of the code," Dorothy Joyce, the mayor's press secretary, said in a written statement. "We will work with local colleges and universities to educate students and property owners about the new zoning. As [with] all zoning, we expect all property owners to adhere to the letter of the law." Officials have not determined the specifics of enforcement, including possible fines. The text of the zoning amendment is quite brief, merely changing the definition of what constitutes a "family" under the zoning code. No enforcement procedure or penalties was part of the amendment, but will instead be developed by the city after the Mayor signs the amendment. "The late Councilor Brian Honan and I talked about this in 1998 before [Michael] Ross got on to the body. It’s been an issue predominantly in student neighborhoods for a number of years." Councilor Honan died unexpectedly in 2002. The TAB did not ask Councilor Murphy the obvious question about why he and Councilor Honan would have been talking about this zoning change back in 1998. The city had zoning language in place in 1998 limiting apartment occupancy to four or fewer unrelated people, which led to the Boston court case and subsequent consent decree in 2003 invalidating that zoning language. It was the 2003 court case that allowed property owners to pack students into apartments legally for the last five years. Before 2003, students could be packed into the apartments illegally -- and from now forward they could be packed into apartments illegally, too -- meaning that the problem in 1998 was one of enforcement, not of the zoning language in place at the time. I take this to mean that Councilor Murphy was actually referring to 1998 conversations about what to do about illegal apartment-packing, not that he and the late Councilor Honan were talking in 1998 about instituting a zoning change like the one adopted yesterday. Menino has submitted a letter backing the proposal, which would amend the city’s zoning code to prohibit landlords from renting out a single unit to more than four students. Ross also has letters and pledges of support from a dozen neighborhood groups, and even a top downtown developer. The Zoning Board will be meeting Wednesday morning to consider the proposal. Their approval is the last step in implementing the zoning rule change. The expansions are putting the squeeze on the city’s real estate market, with landlords cashing in by renting out apartments for $3,000 to $4,000 a month to half a dozen or more students at a time. Actually, some of the apartments have as many as 10-12 students, thereby netting twice that in monthly rent. When such over-renting appears in a two-family house, such as 62-64 Kirkwood Road in Brighton, the rental value could easily be quadruple the Herald's number -- and be accompanied by a series of ISD code violations in the process. No family renter can compete with these high prices that landlords can collect from over-packed student renters. The Allston-Brighton TAB editorial page has not taken a position on the proposed zoning change, while the Boston Herald editorial page took a position in January against it as did the Boston College student newspaper, The Heights. A number of local institutions of higher education are in support of the proposal, according to District Councilor Michael Ross. The TAB editorial notes that Jack Dunn, Director of Public Affairs at Boston College, "supports" the idea, although this does not appear to be the same as strong institutional backing from BC. The Greater Boston Real Estate Board opposes the proposal and thinks it violates the law -- even though, as Councilor Ross has noted, many other cities and towns in Massachusetts, such as neighboring Newton, have passed nearly identical ordinances. The TAB covered a meeting last month of the Allston Civic Association on the topic. The Zoning Board will be meeting tomorrow (Wednesday) at 9:00 am to consider the proposal. The City Council passed the petition unanimously in December 2007, and the Board of the Boston Redevelopment Authority passed an amended version of the ordinance last month that would specify that the rule applies only to undergraduate students, not graduate students. Agenda: Proposal to limit student rental units to four or more people unrelated by blood or marriage/family status. Contact the Zoning Commission directly by writing to the Chairman and Members of the Zoning Commission, 1010 Massachusetts Avenue, Boston, MA 02118. The family, or at least its most vocal members, wants the body to stay where it is; BC wants it removed; and the archdiocese is trying simultaneously to honor the memory of one of its most powerful leaders, keep its promise to BC, and respect the family's wishes. 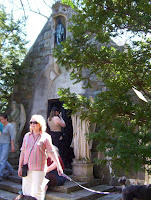 O'Connell reiterated his wishes in his will, using a different name for the chapel, but writing, "I direct that my funeral obsequies be as simple as possible and that I be buried in the Chapel of the Blessed Virgin on the grounds of St. John's Seminary, Brighton, Massachusetts." [Paul] Kirk made it clear that his family is prepared to contest any attempt to move the body in probate court, which has jurisdiction over disinterments. "The family has talked about this, and it's not absolutely unanimous, but there's an obvious consensus that the thing everybody wishes for is that the cardinal remain where he now lies," Paul Kirk said. Graves of Sulpician Priests Redivivus: "Take Your Dead With You"
As I wrote in an earlier post, there used to be graves of Sulpician priests on the land, but those graves may have been exhumed and moved in 1928 -- although the documentation on the matter appears to be unclear, according to a letter written by the Massachusetts Historical Commission. When the young O'Connell wanted to become a priest, the Archdiocese's St. John's Seminary was run by Sulpician priests who denied him entrance; O'Connell proceeded to be trained elsewhere. Soon after Cardinal O'Connell was named Archbishop of Boston he got rid of the Sulpician priests running the seminary, and put diocesan priests in their place. Upon doing so, O'Connell told the Sulpician priests to "take your dead with you," or something like that. The problem with that story, however, is one of timing. Cardinal O'Connell was Archbishop of Boston for 1907-1944, but the possible records of the disinterrment of those Sulpician graves, and subsequent reburial either at Evergreen Cemetery in Brighton or in Maryland (the U.S. center for the order) suggests it occurred in 1928, according to Brona Simon in the MHC letter. The history of St. John's Seminary also states that the Sulpician priests were replaced by Archdiocesan priests in 1911. Why Cardinal O'Connell waited 17 years after replacing the Sulpicians before driving out their predecessors' graves doesn't make much sense if the story retold by Keady is accurate. Boston Herald article (via AP, via "information from Boston Globe"). Update: added link to St. John's Seminary history and date 1911; modified last sentence to 17 years after replacing priests, not 21 years after being named archbishop. The WGBH Community Advisory Board holds its bi-monthly business meeting Monday night at 5:30 pm, which is open to the public. I previously wrote about how the housing foreclosure market appears to be mostly passing by Allston-Brighton, based on no foreclosures in A-B for January 2008. The Boston Globe's City Weekly has a front-page story in today's paper providing statistics (from the Warren Group) for all housing foreclosures in Boston in 2007 which confirms this picture. Allston-Brighton had thirteen foreclosures during all of 2007 -- far fewer than the hardest-hit neighborhoods, particularly Dorchester, and a small fraction of the 705 foreclosures throughout Boston. Massachusetts Attorney General Martha Coakley released a report yesterday making series of recommendations related to governance, management, and organization to help the Caritas Christi Health Care System (CCHCS) to "address the challenges it faces and achieve stability." The Attorney General's study was done by an outside group, the Health Strategies & Solutions, Inc. (HSS). The Caritas system as a whole has been plagued by financial problems, including a very low operating margin of 0.8% (compared with 3% for a "healthy" non-profit) and continued losses in the Caritas Physician Network (expected to be $15 million in 2008, down from $30 million in 2007). It has been without a permanent replacement for its chief executive officer for nearly two years. St. Elizabeth's Medical Center in Brighton Center is part of the Caritas system, and operates as a teaching hospital affiliated with Tufts Medical School. The Boston Globe noted that St. Elizabeth's "is among the worst-performing hospitals in the Boston area, according to statistics compiled by the state Division of Health Care Finance and Policy." CCHCS leadership perceives one opportunity to be in the area of cardiovascular services. Caritas St. Elizabeth’s should focus on its core service area, for the most part competing with local hospitals for patients. HS&S understands that CCHCS has initiated a process to develop a contemporary strategic plan for Caritas St. Elizabeth’s. The previous CCHCS administration developed a “System Forward” strategy which identified Caritas St. Elizabeth’s as the tertiary/quaternary referral center hub of CCHCS. Current CCHCS management understands that this is not a practical strategy. Caritas St. Elizabeth’s has insufficient resources and capabilities to compete successfully for a wide range of tertiary care services in the highly competitive Greater Boston marketplace. Caritas St. Elizabeth’s should function as a community teaching hospital, with continued emphasis (and development of advanced capabilities) in two to three major service lines where it can be competitive. CCHCS has initiated a process to develop a contemporary strategic plan for Caritas St. Elizabeth’s. Financial losses resulting from employment of or contractual arrangements with physicians should be addressed as a top priority. Failure to successfully address these issues in a timely manner will result in deterioration of CCHCS’ competitive and financial positions. According to the HHS presentation, having St. Elizabeth's operate as a tertiary care services facility appears not to have worked because: (1) St. Elizabeth's is "not clinically prepared or capable" of being a tertiary center; and (2) doctors from other hospitals in the system were not making referrals to St. Elizabeth's due both to the geographical distance between Caritas hospitals. The Archdiocese of Boston owns the Caritas system. It has been looking to sell it for several years, but has limited the search to buyers who would maintain the religious foundation of the system. One buyer, Ascension Health of St. Louis, backed out of an agreement to purchase the system after disclosure that the physicians group had overstated its revenue by $10 million. A subsequent sale attempt to Catholic Health Initiatives of Denver also fell through. The most compelling priority confronting Caritas is the need for the Archdiocese of Boston to relinquish direct and indirect control over strategic, operational, and financial matters of Caritas while retaining influence only over matters of religious direction. Operating a hospital system is an extraordinarily complicated business, a recognition that has led virtually all religious organizations throughout the nation to transfer control to lay boards while in most cases maintaining a commitment to the religious principles upon which the systems were founded. Indeed, last year, the Archdiocese approached three different national organizations about potentially assuming control of Caritas -- all are lay organizations that adhere to and promote the religious principles of the Catholic faith. It is in the best interests of Caritas that the Archdiocese transfer total control of the business of the system to an independent Board of Governors, which should have the sole authority to choose Board members and the chief executive, and to run Caritas in the manner it deems appropriate with no outside influence except on matters of religious direction. Governance has been a recent problem for the Caritas system. Its chief executive officer, Dr. Robert Haddad, stepped down in 2006 due to allegations of sexual harassment. Caritas has been unable to fill that position ever since, resulting in a lack of top leadership during a time of challenging finances and competition. St. Elizabeth's is currently undergoing a major construction project to expand and modernize its emergency department with a new building at the intersection of Washington Street and Cambridge Street. A new access road, which would start from near the intersection of Washington Street and Monastery Road, appears to be on hold since it was disclosed last summer that the archeological excavation would be required at the site. The access road also would pass close to St. Gabriel's Monastery, which is classified as a Local Landmark and is on the State Register of Historic Places. Here's a link to the Boston Globe story about the Attorney General's Report in Friday's paper. BC Task Force Meeting for March 18th is CANCELLED, according to John Fitzgerald of the Boston Redevelopment Authority, because "BC is still in the very early stages of responding to the many issues raised in the Scope, there is not much new business [to] discuss." I find it odd that the BRA is cancelling the meeting because BC has nothing to present, rather than have the task force decide whether or not to cancel their own meeting. They could consider using the open slot for something else -- like a neighborhood discussion about what thinking went into the task force's letter, how the process will move forward in the coming months, etc. The Community Builders Inc. has submitted a Project Notification Form to the Boston Redevelopment Authority describing their proposed new development of 400 housing units on part of the Brighton Mills shopping center (plus a smaller parcel across Western Avenue) that would provide housing for the current residents of the 213 housing units at the Charlesview Apartments at Barry's Corner. The new site encompasses 6.92 acres. Significant neighborhood opposition appears to be forming around a number of specific elements of the proposed replacement housing project: the development is too dense, the buildings too high, the buildings are segregated between affordable (mostly south of Western Avenue) and market-rate (north of Western Avenue), and the mix of units are too family unfriendly. The proposed development will be the subject of two public meetings convened by the BRA as part of the public comment period on the project: March 10th and 24th at 6:00 - 7:30 pm at the New Balance Headquarters, 20 Guest Street, Brighton, in the 2nd floor cafeteria. The new development would be part of a land swap between Harvard University, owner of the Brighton Mills and adjacent parcel, and the owners of the Charlesview Apartments. Harvard would subsequently own the current site of the Charlesview Apartments, which is contiguous with many other parcels Harvard owns in North Allston; the Charlesview site would become incorporated into their institutional master plan district, as was indicated in their 50-year institutional master plan filed with the BRA in January 2007. The proposed new development would provide housing not only for the Charlesview residents currently occupying 213 units, but also an additional 187 units of housing for a total of 400 units, including 118 condominium units (all north of Western Avenue). The Brighton Mills buildings in question are currently vacant after Harvard terminate leases with the previous occupants (Kmart [here and here], OfficeMax, and Frugal Fannies) over the last few years. The Shaw's supermarket is not part of the proposed development and would be unaffected. Three buildings exist on the parcel across Western Avenue, which would be demolished to make way for the new buildings. The height of the new buildings would vary from four stories adjacent to North Brighton housing on Litchfield Street, six stories along Western Avenue, to a ten-story tower closest to the Charles River along Soldiers Field Road. Density. The proposed 400 units of housing is much too dense for the location, exceeding current zoning density by approximately a factor of two. It is more dense than the neighboring area by a factor of three or five, depending on who you ask. Too Many Rentals, Not Enough Owner-Occupied. Allston-Brighton has only a 19.3% rate of owner-occupied housing, well below the city-wide average of 31%(?). In order to bring A-B closer to the city-wide average, the fraction of owner-occupied housing in new housing projects needs to exceed 34%. Basically: put all the housing beyond 213 units (to accommodate current Charlesview tenants) up for sale, rather than have some of it be rental. Ten Stories Is Much Too Tall. Why such a tall tower closest to the Charles River? To make money to pay for the whole project by selling those as the market-rate units. But that doesn't make up for the problem that ten stories is much, much, much too tall for that neighborhood; it's also twice what zoning allows. North Brighton doesn't have buildings approaching that height, so the relocated Charlesview should stick to heights more consistent with the neighborhood. Unit Mix is Not Family Friendly. Too many of the units will be 1-bedroom (116) and 2-BR (166), while very few will be 3-BR (77) or 4-BR (41). In fact, the new units (i.e., those not replacing the 213 units at the current Charlesview) are mostly 1-BR (44) and 2-BR (126), with very few new 3-BR (17) and no new 4-BR. Units with fewer bedrooms are appropriate for 20-30-year-olds (or so), but not for families that will need additional bedrooms -- and extra closets, etc. Only 33% of A-B households are family households, while the city-wide average is 48%, indicating that new housing in A-B should emphasize family-friendly features in order to attract families. For the Charlesview relocation proposal, it would be better to change the mix of units to encourage families to move in, rather than to force residents to move out once they have kids. Vancouver, British Columbia has been successfully pushing for family-friendly housing in their downtown; Vancouver has a 25-page set of guidelines as to what makes housing family-friendly. Open Space. The overall amount of open space appears positive, but it is broken up into several pieces that are walled-off from the rest of the neighborhood. Better would be to put the playground across the street from existing houses to foster interaction between existing and new residents. Segregation of Affordable vs. Market-Rate Housing. The proposal will put the market-rate housing into the Telford site tower nearest to the Charles River, while putting the affordable housing south of Western Avenue. This isolates the "affordable" housing renters, who will be primarily low-income, from the "market-rate" housing purchasers, who will be higher-end. The neighborhood wants integrated housing, not housing segregated by income. Setbacks on Western Avenue. OK, I haven't heard this from anyone. Yet. But look at that six-story building (plus mechanicals making a seventh story) butting right up against Western Avenue. No one will want to walk on a Western Avenue darkened by shadows from that tall building without setbacks. Harvard Should Be Involved. Yes, you heard that right. Harvard is claiming that they are hands-off towards the development, letting Community Builders Inc. define and defend the project. But since Harvard owns so much of everything around the proposed housing, and since Harvard currently owns the land that would be swapped with CBI, Harvard could easily help guide the project. After all, manyof the market-rate units might end being sold to Harvard employees. The ABNNF met earlier this week to discuss the Charlesview relocation proposal. Over at the Allston Brighton Community Blog, Harry Mattison has links to articles already up about the meeting. Neighborhood opposition appears to be forming around key aspects of the proposal. Mattison questions whether the builders could seek outside funding that could make the project work presumably with fewer units. Harvard has declined to take a role in the project, while Mattison thinks Harvard could play a positive role in the project. He also sees the pattern of the city allowing over-dense housing developments in exchange for additional affordable housing in those developments. The Boston Globe's City Weekly also ran a story last week. The BRA has a webpage with more information on the PNF, including a complete PDF of the PNF (warning: 21.9 MB!) available online. Both at the New Balance Headquarters, 20 Guest Street, Brighton, in the 2nd floor cafeteria. The Boston Bulletin and Allston-Brighton TAB carried a story in January that was probably passed over by everyone except political junkies: Boston City Councilor-At-Large Sam Yoon was appointed by Democratic National Committee Chairman Howard Dean to sit on the DNC's National Convention Rules and Bylaws Committee. Councilor Yoon's appointment means that a local elected official may have a key role in influencing the Democratic Party's nomination for president. The Rules Committee may have to rule on two related issues: (1) whether Florida or Michigan can hold "make-up" primary or caucus contests before June 7th; and (2) whether or not those two states' delegates can be seated at the DNC's national convention this summer, should they not hold the "make-up" primaries. Yoon said there could be a lot for the Rules Committee to look into this year. Because they scheduled their primary early, Democratic leaders stripped Michigan of all its delegates to the national convention. "We’ll have to consider whether to allow the delegates," Yoon said. The Rules Committee might normally be considered an obscure and relatively unimportant body within the Democratic Party, but this year it could play a crucial role in determining whether Senator Hillary Clinton or Senator Barack Obama wins the party's nomination for president. The reason is that the DNC stripped two states, Michigan and Florida, of their delegates -- both pledged (elected) and super-delegates -- prior to the two states' primaries, because both states scheduled their primaries earlier than February 5th, which was against party rules adopted in 2007. Should the Rules Committee have to address any divisive issue between the two leading Democratic candidates, Councilor Yoon's appointment by Dean can be considered a win for Senator Obama. Yoon noted that he has campaigned for Obama. There is some confusion among political commentators about which DNC body will determine whether or not the delegates from Michigan or Florida are seated. Many commentators have mentioned the Credentials Committee, not the Rules Committee, as the body that will decide whether or not those two states' delegates will be seated. The Credentials Committee is responsible for resolving any questions regarding the seating of delegates and alternates to the Convention. The Rules Committee, on the other hand, "is responsible for recommending the rules for the convention, rules of the Party, and other convention business," which includes "resolutions on any matter not addressed by other standing committees." On a February 2008 broadcast of "On Point" on WBUR, Elaine Kamarck, lecturer at Harvard University's Kennedy School of Government, said that she was on the Rules Committee when it decided to strip Michigan and Florida of their delegates. She confirmed in an email that it is the Rules Committee that will likely have to decide whether or not to seat those two states' delegates. I interpret the DNC document and Dr. Kamarck's statement together to indicate that the Credentials Committee would rule on seating particular delegates and alternates within the rules laid out by the Rules Committee. UPDATE: A member of Councilor Yoon's staff has contacted the DNC to inquire if the Rules Committee's work includes potentially deciding on whether or not to seat the Florida and/or Michigan delegates. The DNC responded to Yoon's office that the issue of seating delegates is for the Credentials Committee, not the Rules Committee, in contradiction with the statements [above] by both former (Kamarck) and current (Walters?) members of the Rules Committee. Obviously there appears to be some degree of confusion on the issue, so stay tuned for more. UPDATE: A member of the Rules Committee last year is quoted anonymously at The New Republic blog both that it was the Rules Committee stripped the delegates and that Michigan is leaning heavily towards running a "make-up" caucus before June 7th. We would love to have them [Michigan and Florida] seated, but they would have to be seated within the rules. A year-and-a-half ago, we set a primary schedule which Florida and Michigan both voted for. What you cannot do is change the rules in the middle of a contest. I think every American understands that. There's been a lot of talk about things they can do; we've been very clear what they can do. 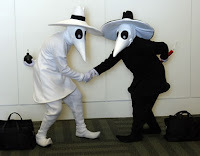 One, they can resubmit to the Democratic National Committee Rules Committee a set of rules to pick delegates that are within the rules that they agreed to. Or two, if they don't want to do that, they can appeal to the Credentials Committee and hope for the best in July. What does come at a cost is BC's 10-year plan, a $1.6 billion effort to better the University. In addition to increasing the range of academics and activities available to undergraduates and the community, BC is also spending precious funds to increase the number of students on campus per the city of Boston's new recommendation. Unfortunately, putting more students on campus is not enough for the neighborhood of Allston-Brighton. They also want to decide when, where, and how we do so. A popular opinion of the surrounding neighborhoods demands that BC add additional stories to residence halls on the Chestnut Hill campus to dissolve the need for housing on the Brighton Campus [former St. John's Seminary land]. Does an institution of higher education in Boston have the "right to expand" as they see fit? What McCartney fails to recognize is that Boston has, for the past 15 years, has been about the most institutional-friendly Zoning Code that could be invented. What do I mean? Article 80 of the Zoning Code dates back to 1992, and contains the guiding statutory language governing institutional master plans and other large and small project reviews. Article 80, in a nutshell, establishes a process by which any institution can re-zone their land to build absolutely anything. Yes, literally anything can be built on such land, regardless of the existing zoning. If BC were to propose a 100-story building at the former St. John's Seminary land, for example, then Article 80 review is basically all they would need to get approval to break ground. Before Article 80, the underlying zoning for the land ("Conservation Protection Subdistrict") under Article 51 of the Zoning Code would have applied, which forbids skyscrapers. The example is extreme, but the parallel is real. BC is currently proposing dormitories for the same seminary land, which are "forbidden uses" under Article 51 of the underlying Zoning Code -- just like a skyscraper is a forbidden use. That BC proposed dormitories at all for that land is an indication of how permissive Boston's Zoning Code is, in practice, towards institutions. It might be appropriate for McCartney instead to thank the city of Boston profusely for having a Zoning Code so lax that BC could even consider proposing building those two dormitories. A few days ago, the Boston Globe ran a letter-to-the-editor written in response to a news story about the Boston Redevelopment Authority's Scoping Determination on on Boston College's proposed Institutional Master Plan. In the original news story, Jack Dunn, Director of Public Affairs at BC, accused the opponents of two undergraduate dormitories of engaging in "NIMBY-ism". "I WAS surprised to read, in the article "City tells BC to revise its plan" (City & Region, Feb. 22), that Boston College spokesman Jack Dunn accuses the Brighton neighbors of so-called NIMBY-ism for opposing BC's plan to build dorms on the Brighton campus. NIMBY is an acronym for "not in my backyard." Dunn has it backward. For years, the Brighton neighborhood has lived with BC students "IMBY," and know only too well what that means - rowdiness, trash, and disrespect for private property. By building dorms abutting the Lake Street and Commonwealth Avenue neighborhoods, BC would be asking us not only to have students in our backyards but in our side yards, our front yards, and practically in our living rooms. For Dunn to use the pejorative "NIMBYism" to describe the Brighton neighborhood's legitimate concerns undermines the community's good-faith efforts to work cooperatively with Boston College." Until now, Mayor Thomas M. Menino has expressed support for the project. "When we saw the traffic study, it became clear to everyone that this project would create an undue hardship for the neighborhood, especially on weekends," said John F. Palmieri, director of the Boston Redevelopment Authority (BRA). "We want to continue to work with Lowe's to find an appropriate location in the city, but the Brighton site is not viable for that use." What was the traffic problem highlighted by the study? I did not attend the public meeting last Monday at which the traffic consultants for Lowe's presented their traffic study. But the preliminary traffic study that was in the original PNF is probably close enough to understand why Mayor Menino changed course. Assumptions. The number of vehicle trips that would be generated by the proposed Brighton Lowe's was based on 198,000 square feet of retail space (excluding parking), along with parking for 378 vehicles in a parking structure. According to national data, 48% of trips for a home improvement "superstore" are "pass-by trips," i.e., where the vehicle is already traveling in the area (commuting, going to another store, etc.). In the PNF, the traffic analysis reduced the number of generated vehicle trips by 25%, not 48%, so as to create a conservatively high estimate of the impact of the store. According to one attendee at last week's meeting, however, the traffic presentation may have adopted a more generous 50% reduction in trips; if so, then the project may create significantly larger traffic impact than their latest study, indicating that the traffic problem could be even worse. On weekday evenings, there will be 363 new trips per hour, i.e., one additional car entering or exiting the immediate neighborhood every ten seconds. At midday on Saturday, it's more than twice as bad -- a new car every four-and-a-half seconds. According to one attendee at the meeting, the new Saturday vehicle trips would increase midday vehicle trips on at least one street by 150%! There aren't many routes into or out of the site: a one-way to Everett Street by the Stop-and-Shop, a traffic signal at North Beacon Street by the Volvo dealer, or a traffic signal at Market Street by WGBH. Splitting up the exiting traffic to North Beacon Street and Market Street, roughly seven additional vehicles would have to make it through each two-minute green traffic light-cycle. The Brighton Landing site is right next to the Massachusetts Turnpike, but it is nearly a mile away from an entrance to the Pike. The standard route to and from the Pike would have to pass through a one-lane bottle-neck on Cambridge Street southeast of Harvard Avenue at Allston Village. These kind of big box stores are usually best placed near to highway on-ramps. result in 400 employees or around 1000 vehicle trips per day (based on methods used for the Harvard science complex traffic study) -- compared to the 4,422 daily vehicle trips for the 200 new, permanent jobs that would be created by the store. I bet that Mayor Menino looked at the trade-offs for the site, traffic, and the nature of the mostly low-paying jobs that would be created, and decided that it just wasn't worth all the expense and bother. There has been some amount of discussion about the topic on the AllstonBrighton2006 Google Group.